Surf Coach and Photographer, Armi Kasang speaks fluent English. She graduated with a English teaching degree at the University of Kupang. 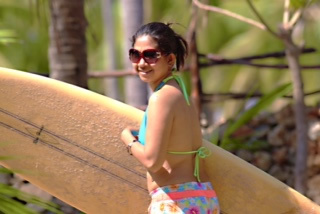 She is one of the few Indonesian women surfers in this Province of Nusa Tenngara. Armi specializes with the beginner, children, and the intermediate surfer on their first time out at the local breaks here in Nemberala. Take Armi out with you, learn the positioning at the local surf breaks, catch more waves, better your timing and paddling skills, at a very good price. Want to hire a photographer while you’re here in Rote? One private session is $30 USD, group session is $40 USD. Customer keeps all photos. Armi regularly rides along on boat excursions photographing surfing on neighboring islands. While you are here on Rote Contact Armi. Armi also takes photos of weddings and famous models as in the first and last photos on this page.